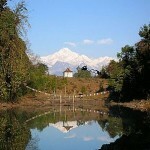 The overall difficulty level of this trek is considered “Easy” and there are numerous options for completing this trek. 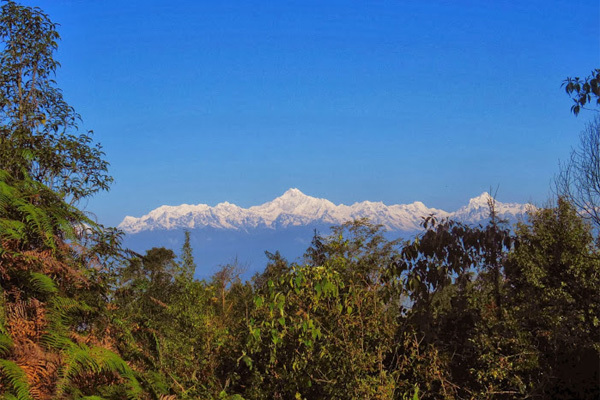 Our Starting Point for the Mulkarkha Lake Trek is the small village of Lingzey in West Bengal. 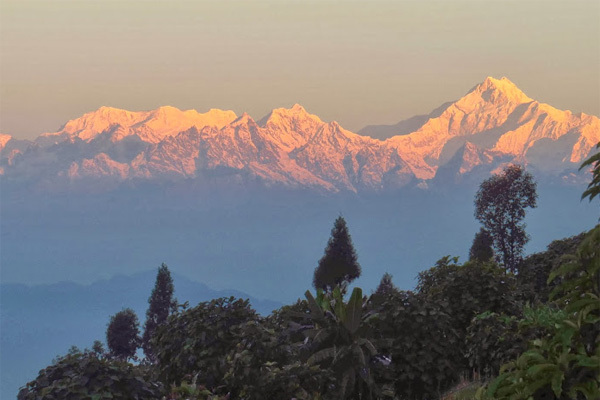 This little Himalayan village has the second largest temple in Darjeeling district. Throughout the year several Hindu festivals are held in the temple complex. The most important among them are the Sawan Bole Bhum, Shivaratri, Durga Puja, and Bala Chaturdasi. There is also a Sanskrit Vidyalaya in Lingzey which stocks rare and valuable books of Hinduism. 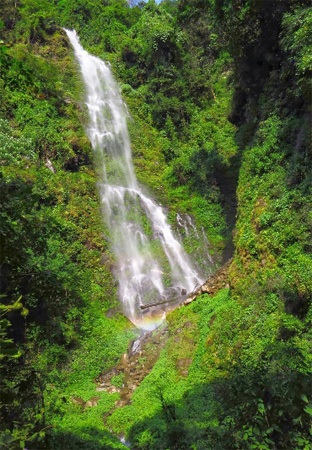 Other than that, Lingzey also has a Hot Suphur Spring, few traditional Lepcha Houses and the Rang Bang River. 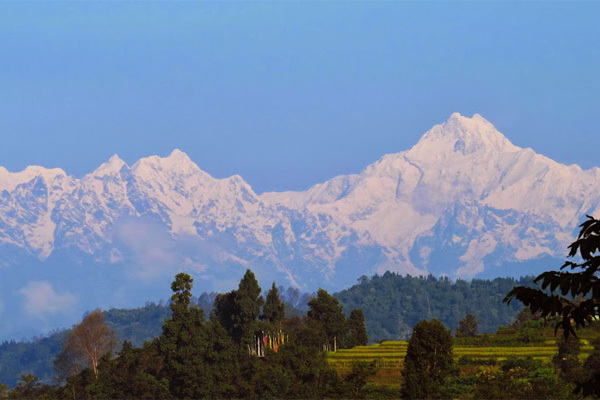 Places of Interest: Hareshwar Shivalaya Mandir & Sanskrit Vidhyalaya, Lepcha Monastery, Traditional Lepcha House, Devi’s Than, Sankhey Dhunga, Dawaipani (Hot water sulphur-rich spring), Rang-Bang River Side Picnic Spot, Sericulture. Introduction with porters and Guide in the morning. 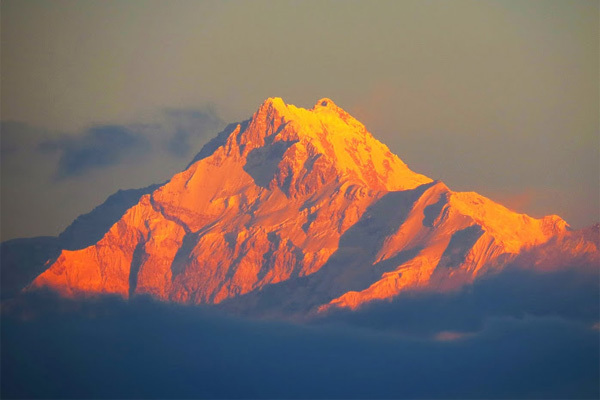 Have breakfast and a Brief of the trek from the guide and start for the trek from 8:00 am. Reach Jhusing at 1:00 pm. Stay in our Homestay facilities and have lunch. Take rest and get a brief of next day’s trek. 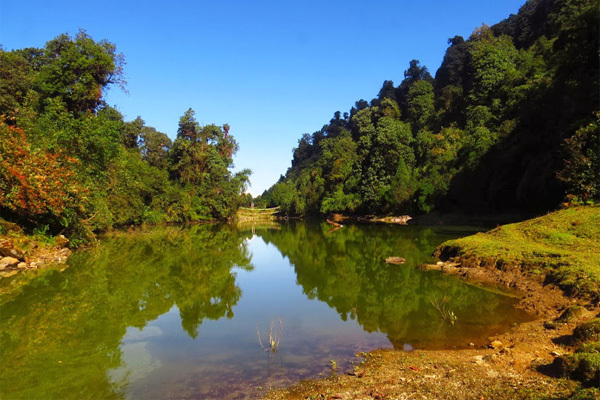 Places of Interest: Jhusing View Point, Servang Waterfalls, Mini Micro Hydro Project River Recreation. Early morning visit to Jhusing View Point for a mesmerizing sunrise over Himalayan Ranges (including Mt. 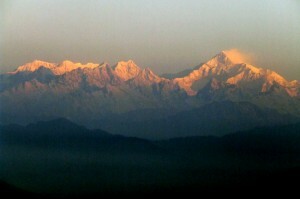 Kanchandzonga)). Have breakfast at Jhusing and leave for Tagathan (3 kms) at 9:00 am. Reach Tagathan at 1:00 pm. Have lunch and stay overnight at Tagathan Homestay. Places of Interest: Tagathan Falls, Dhoksingh Falls and nice view of Newra valley National Park. Early morning visit to nearby Tagathan Falls. 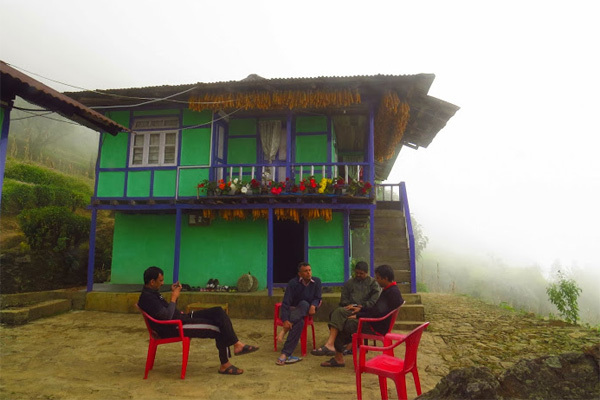 Return to Tagathan Homestay, have breakfast and then start trek at 8:00 am. Reach Mulkarkha by 12:00 noon. 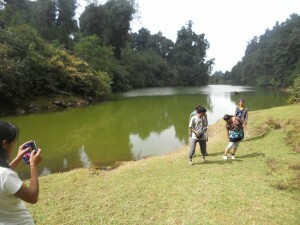 Places of Interest:Enjoy the lake surroundings and the nearby Jungles. Early morning visit to Mulkarkha Lake to see the reflection of Mt. 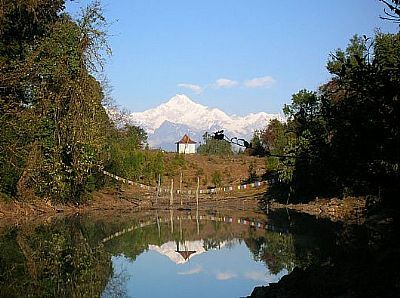 Kanchenjungha on the lake. Have breakfast and then return to Lingzey via Chota Ramitay Dara (view point), Pithamchin village, Sherpa monastery. Mid way have lunch. Stay overnight at Lingzey. 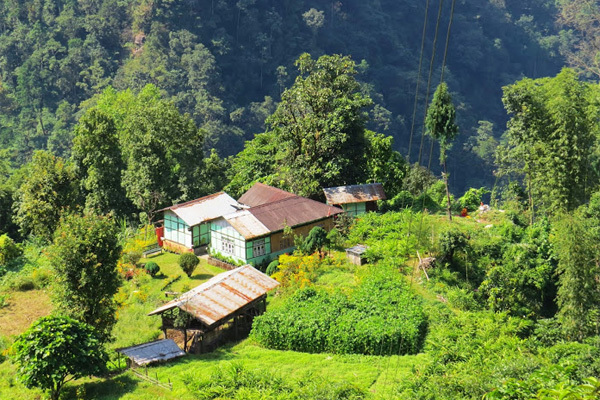 Places of Interest: Hareshwar Shivalaya Mandir & Sanskrit Vidhyalaya, Lepcha Monastery, Traditional Lepcha House, Devi’s Than, Sankhey Dhunga, Dawaipani (Shulphuric water spring), Rang-Bang River Side Picnic Spot, Sericulture. Day 2: Reach Chota Ramitey by car and trek to Mulkarkha Lake. 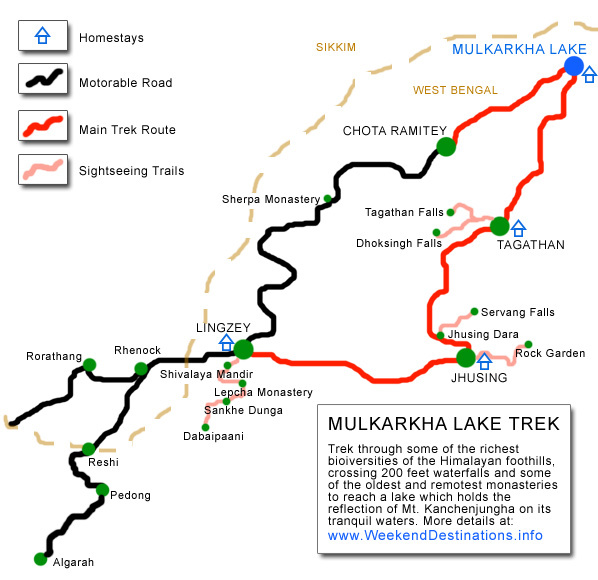 Stay overnight at Mulkharka Lake. 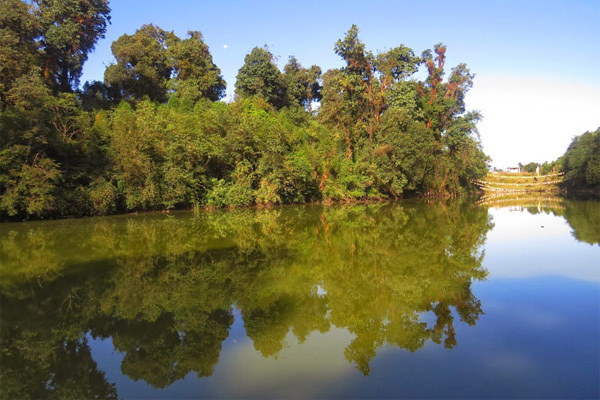 Places of Interest: Visit the Mulkarkha Lakeside and enjoy sunset and surrounding jungles. 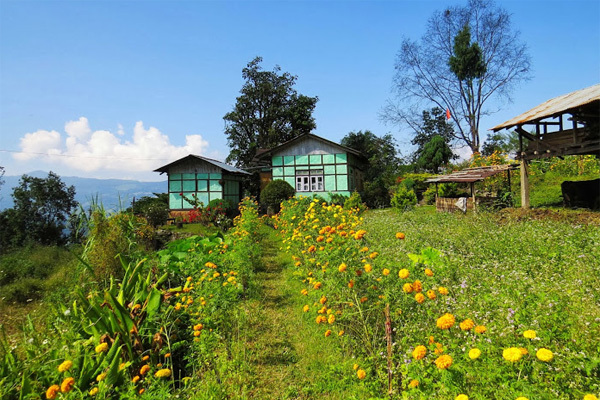 Where to stay: Homestay facilities. Day 3: Reach Jhusing. Local sightseeing. Stay Overnight. Day 4: Reach Lingzey. Local sightseeing. Stay Overnight. Have breakfast and early morning sightseeing at Lingzey. Leave Lingzey by afternoon to reach NJP / Bagdogra by evening. Day 1: Reach Lingzey. Local sightseeing. Stay Overnight. Reach Lingzey by car from NJP / Bagdogra by afternoon. 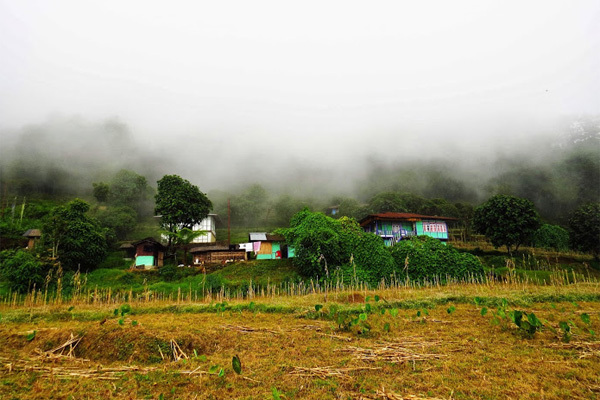 Do some local sightseeing and stay overnight at Lingzey. 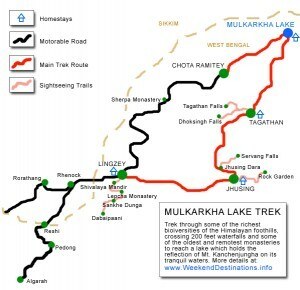 Day 2: Reach Chota Ramitey by car and trek to Mulkarkha Lake. Stay overnight at Mulkarkha Lake. 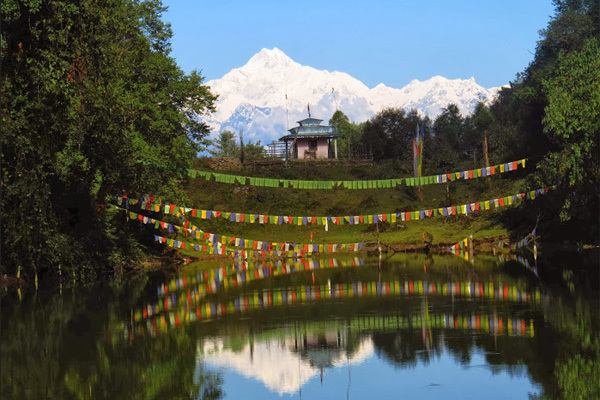 Places of Interest: Places of Interest: Hareshwar Shivalaya Mandir and Sanskrit Vidhyalaya, Lepcha Monastery, Traditional Lepcha House, Devi’s Than, Sankhey Dhunga, Dawaipani (Shulphuric water spring), Rang-Bang River Side Picnic Spot, Sericulture. Photo Courtesy Dr. Arutirtha Chatterjee and others.